On the football field, Walter Payton gained as many yards by running over people as he did by running past them. His choice of automobiles reflected that same mix of raw power and sneaky speed. Payton’s most cherished car, his 1979 Porsche 930 Turbo, is for sale. It’s a 3.3-liter six-cylinder with a four-speed, silver exterior, original paint in excellent condition, with a “whale-tail” spoiler and a sunroof. The interior is black leather. 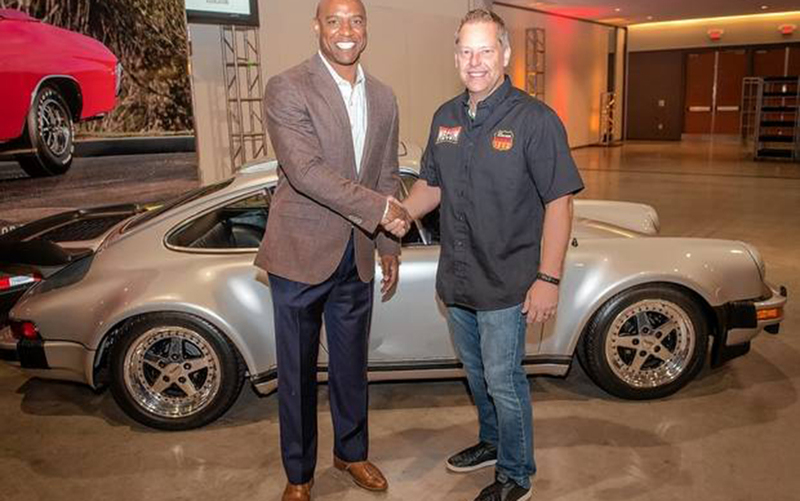 You can bid on Payton’s Porsche at the Mecum’s Chicago auction, which takes place through Saturday at the Schaumburg Convention Center, in suburban Chicago. Similar cars — those not owned by the greatest player in Bears history — typically sell for $100,000 to $200,000 depending on condition and accessories, so bring your platinum card. A live-stream of the auction is available at mecum.com. Payton willed the car to his son, Jarrett, who has driven it occasionally since his father’s death in 1999. But he felt it was time to let it find a new home. Walter Payton had been with the Bears for five seasons and was 25 when he purchased the 930. In its day, it was one of the most powerful production cars available in the U.S.
Payton always had an interest in fast cars. He drove in the celebrity race at the Long Beach Grand Prix in 1988 and 1989, then moved up to the Trans-Am series but stopped driving competitively after a crash at Road America in 1993. A year later, he formed a racing team with Dale Coyne that ran in the IndyCar series. Payton’s longtime representative and business partner Bud Holmes talked Payton out of spending $22,000 on a Ferrari in the 1970s. Payton took the advice but later regretted it. He later assembled a small collection of high-performance cars, including a Lamborghini Countach and a Ferrari Testarossa. Most of those already have been sold. But Payton cherished and pampered his Porsche 930. The car has fewer than 10,000 miles on it.